World Cup soccer (or football, as Little C&G refers to it) fever has started in our house, with all the World Cup qualifiers currently going on. Unfortunately we don't get a lot of European games broadcast here, but ESPN on Apple TV has a long list of matches available to watch on demand. Thank goodness! Little C&G watched the Germany vs. Austria game over the weekend and happily cheered many of his favorite Bayern Munich players on to German victory. 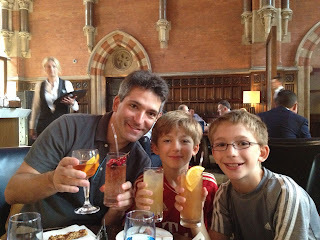 Before heading to the UK in July, I gave each boy the chance to be in charge for one day in London. 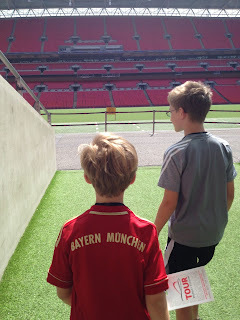 It shouldn't come as a surprise that Little C&G picked a tour of Wembley Stadium, scene of Bayern's fifth UEFA Cup championship win back in May. He couldn't wait to follow in the footsteps of his favorite players, climbing the 107 steps to the Royal Box and hoisting an imaginary trophy over his head to the sound of 90,000 cheering fans. If your little London travelers are fans of the English Premiere League teams, Chelsea and Arsenal also offer tours and both stadiums are easily reached on the Tube. Check the websites ahead of time for the tour schedule and to book your tour online. We couldn't commit to a time (sleeping in, late lunches, etc), but with tours running every half hour (during the summer and school holidays) at Wembley we easily got spots on the next available tour. Our tour started in the famous red seats of the recently renovated (2007) stadium. Our guide filled us in on all the important facts, figures, and architectural marvels that make up the second largest stadium in Europe (Camp Nou, home turf of FC Barcelona is number one). The one fact that the little C&Gs still remember is that there are a record number of toilets in the stadium, 2,618 to be exact. And I'm sure there's never a line at the ladies loo. We also got a behind the scenes look at a locker room, one of four that are used during games. 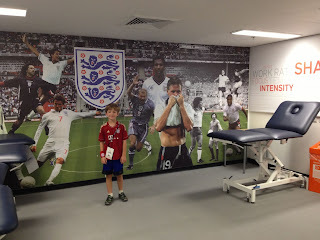 After suiting up in the locker room the only place left to go is out onto the pitch, and we followed the path through the famous tunnel and out onto the field. It took all my effort to not yell "Hello Wembley" at the top of my lungs. From the field we walked up the 107 steps to the Royal Box, posed with a replica trophy for the souvenir photos (for an extra charge), and then finished up the tour inside where we started. Of course the only way to end a C&G outing is with cocktails, and thankfully St. Pancras Station was a quick ride away on the Metropolitan Line. The beautifully renovated St. Pancras Renaissance Hotel was on my list to check out on account of their retro-chic Bookings Office Bar. It's a dramatic, high-ceilinged, old world leather and wood bar straight out of the 19th century, with an equally vintage cocktail menu. We ordered a few bar snacks (we skipped the haggis bon bons. . . ) to go along with our drinks, and sat back and relaxed into the leather club chairs. All that soccer action was exhausting! Wembley Stadium is easily reached on the Jubilee and Metropolitan lines, get off at the Wembley Park Station and you can't miss it as you exit the tube station. Family tickets are £41 (roughly $65USD) for the 75 minute tour of the stadium. The gift shop has merchandise for the English and Scottish national teams, but not for the rest of the Premier League teams, just in case you have a little fan (Little C&G) looking for something specific.